The term "bark cloth" has been known by various names in the Pacific Islands, including: tapa or kapa (Hawaii), ngatu (Tonga), ahu or ka'u (Tahiti), masi (Fiji), and autea (Cook Islands). 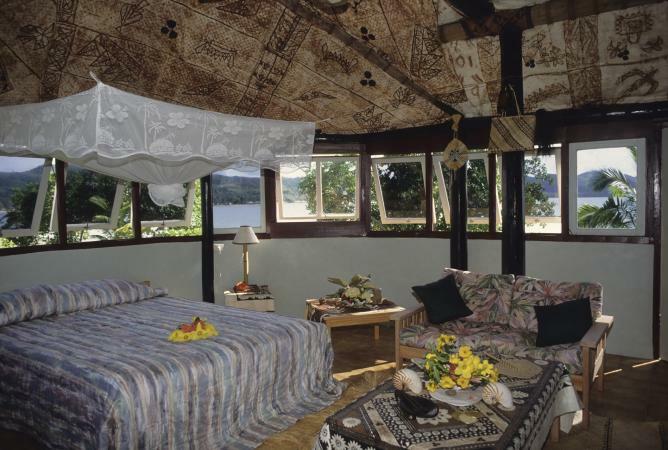 "Tapa" is the popular word now used to describe bark cloth throughout the Pacific Islands. Bark cloth, or tapa, describes the fabric whose source material is the bark of a tree or similar plant material grown in tropical areas around the world and is, therefore, cellulosic. Like felting, bark cloth produces a nonwoven fabric. Like felting, bark cloth or tapa is produced in a warm, moist environment. While the bonding of fibers in felt is mechanical, the bonding in bark cloth is chemical. One of the plants carried by exploring Polynesians was paper mulberry (Broussonetia papyrifera), called wauke by Hawaiians. In addition to paper mulberry, several other plants found in tropical locales have been used for making bark cloth. To start the bark-cloth-making process, the inner bark (bast) of a tree or plant was stripped or removed from its source, the outer bark of a tree or branch, and cleaned. The bast fibers were then placed in water, often seawater, causing the fibers to break down (ferment or ret) into a somewhat sticky substance resembling bread dough. The substance was spread on a specially carved flat wood surface called a kua kuku in Hawaiian and then beaten with grooved wooden beaters, called hohoa, of various thicknesses. As the substance was beaten, it became wider, longer, and thinner and began to dry. It was spread into a thin sheet and laid out to dry with stones holding the edges in place against the winds. The result, depending on thickness, was a fairly supple, somewhat paperlike sheet of fabric. The beating of a hohoa on a kua kuku was also reportedly sometimes used for sending messages. The special houses or sheds used for beating tapa were called hale kuku, and when people gathered for beating, it could be compared to a modern quilting group or party. Bark-cloth-making was refined in many areas of Polynesia, especially Hawaii. Though pieces of tapa were most commonly beaten or pounded together to make larger pieces, tapa pieces were also sewn together with fiber and a wooden needle. Edges were turned under and fused, by beating or sewing, for evenness. Various thicknesses for different purposes could be achieved in the beating process. Fabric could be made so thin as to be gossamer, or thicker strips of the fabric were sometimes plaited. Many sources agree that Hawaiians developed the most complex and greatest number of decorative prints for bark cloth. Some tapa was dyed first by soaking, or sometimes by brushing the dye onto the fabric, or even beating an already dyed piece of tapa into a larger piece. The Hawaiians carved designs into pieces of bamboo often shaped like thin paddles. These strips of carved wood were then used to stamp or print on the tapa with dyes from plants and soil and other sources. The Hawaiians were careful and precise printers, making sure that patterns were straight and continuous. Several patterns might be used on one length of tapa, creating unique patterns. Interesting patterns could also be obtained by plaiting or twisting pieces of tapa or other plant materials into a long strip and then pressing the length against the tapa. The most common colors used were brown, black, pink, red, green, pale to medium blue, and yellow. Bark cloth was derived and used as fabric in other tropical areas well into the late twentieth century. South American Indian populations still living in the remote forests of Brazil, Panama, and Colombia used bark cloth, called damajagua (Colombia), as sleeping mats. Based on photographs and descriptions of researchers, the bark cloth of the South American Indians is crude compared with the bark cloth produced in the Pacific Islands. It appears that one of the biggest reasons South American bark cloth was coarser than that of Polynesia is that the retting time allowed for the bast fibers was considerably shorter, overnight, compared with the several days of retting by Polynesians. Throughout the Pacific Islands, bark cloth was used as a household fabric for both bedding and clothing, and in making ceremonial objects. As clothing, the fabric was wrapped and tied onto the body. It could be gathered or pleated in various ways to create decorative effects for ceremonial occasions. In everyday use, women commonly wrapped the bark-cloth fabric, called a pa'u, around their bodies and tied and tucked the ends in to keep it in place. Women commonly covered only the lower part of their bodies between the waist and knees with the pa'u. The malo, worn by men, was also wrapped around the body and between the legs to protect the genitalia. The malo might or might not have a flap in the front, which could be tucked away depending on tasks that needed to be performed on a given day. Originally only men performed the hula. When performing, additional pieces of tapa could be tied over the malo. Tapa was also tied around the shoulders by both men and women when a little extra warmth was needed. Such capes were called kihei. 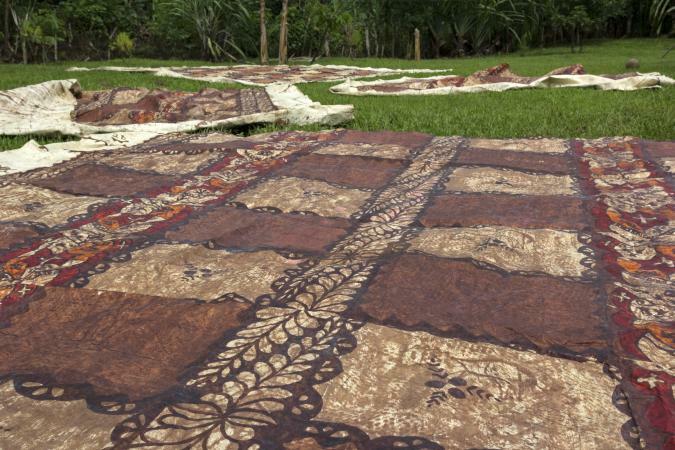 The largest and most elaborate pieces of Hawaiian tapa were made into bedding. Five to eight sheets of plain white tapa were sewn along one edge and then topped with a dyed and watermarked piece. During cool nights the layers could be draped over the sleeper, or laid back, for desired warmth. Tapa was also scented on occasion. Sap, leaves, or flowers were mixed with oil and heated and then added to a dye. Bark cloth is rarely used for clothing today. It lacks the pliability of woven fabrics, it tends to break down when wet, and processing is labor intensive. The fabric does, however, give important information about the tropical cultures in which it was developed. Hobbyists, historians, and others continue to make bark cloth to study and to keep the knowledge and skill of tapa-making alive. In the Pacific Islands, tapa was not found in common usage after the turn of the nineteenth century. See also Felt; Nonwoven Textiles. Abbott, I. A. La'au, Hawaii: Traditional Hawaiian Uses of Plants. Honolulu, Hawaii: Bishop Museum Press, 1992. Abbott is a world-renowned psychologist and Hawaiian ethno-botanist of Hawaiian and Chinese extraction. Hiroa, Te Rangi [Sir Peter H. Buck]. Arts and Crafts of Hawaii: Clothing. Honolulu: Bishop Museum Press, 1957. Buck was director of the Bishop Museum from 1936 to 1951. He was the son of a Maori chieftess and an Irish father. He served as physician and anthropologist and is noted for his substantial contributions to Pacific ethnology. Kaeppler, A. L. Artificial Curiosities. Honolulu: Bishop Museum Press, 1978. Kooijman, S. Tapa in Polynesia. Honolulu: Bishop Museum Press, 1972.